Large electromagnets provide an axisymmetric applied field to study magnetohydrodynamic phenomena in the UMD Three Meter Geodynamo Experiment in the absence of a self-excited dynamo field. The induced magnetic field reveals the structure and dynamics of the underlying flow, and when it's strong enough, Lorentz forces significantly modify the flow. Early MHD experiments used the single equatorial magnet pictured above. Later, two magnets were used in a Helmholtz pair for more uniform field throughout the liquid metal volume. Each of the two electromagnets is 160 turns of 1/2" square aluminum magnet wire wound into nearly 4m diameter coils. The coils handle up to 300A current, supplied by the Kinetics Industries three-phase rectifier supply pictured below. The supply accepts a 4-20mA input for control, but the supply was shared between two labs and not physically located in either of them. 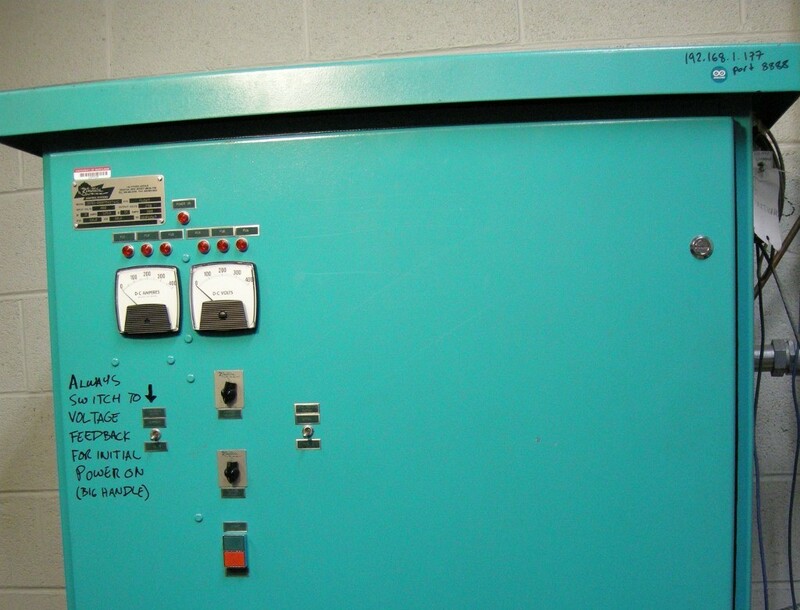 It was used for heater ontrol in the second lab and was sited in between the two spaces, in a mechanical room close to the 480V 3-phase panel. Therefore, it was most convenient to control it over the private wired network that connects the lab spaces. This prevented the need to switch analog control lines and prevented issues with wiring together two labs' acquisition hardware while still allowing easy control from either lab. I designed the Arduino-based networked controller below using an Ethernet shield for communication and a Texas Instruments DAC8551 16 bit digital-to-analog converter to generate the analog control signal. Isolated power supplies and an optoisolator for the DAC's digital serial interface provide complete galvanic isolation between the Arduino and the supply's circuitry. The DAC's 0-5V output is amplified to 0-10V with an op amp and applied across the 470 ohm input resistance of the rectifier control input. Full scale and zero output are trimmed in firmware with a hard-coded calibration. 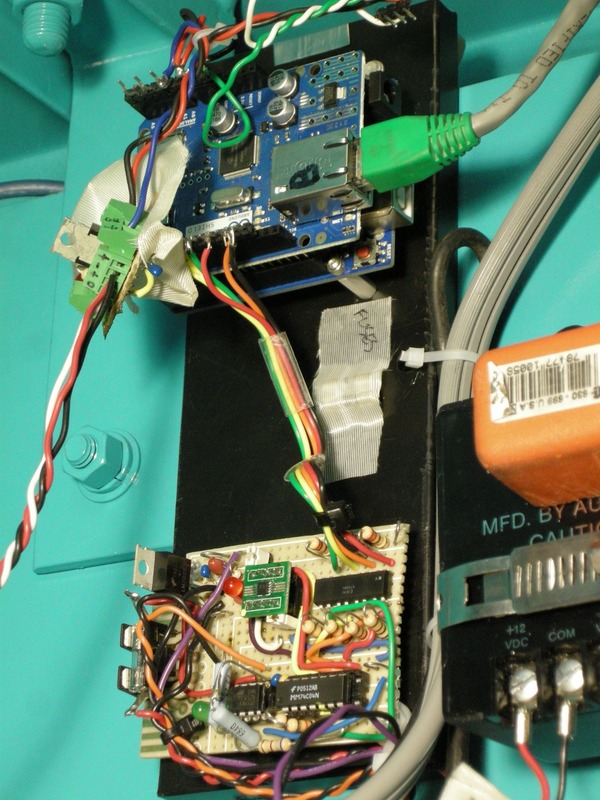 Magnet current is measured using a Honeywell CSLA2DK non-contact Hall effect current sensor and one of the Arduino's built in 10 bit analog-to-digital converters. The supply output is fairly noisy, allowing the use of oversampling and decimation to increase the resolution of the current measurement. 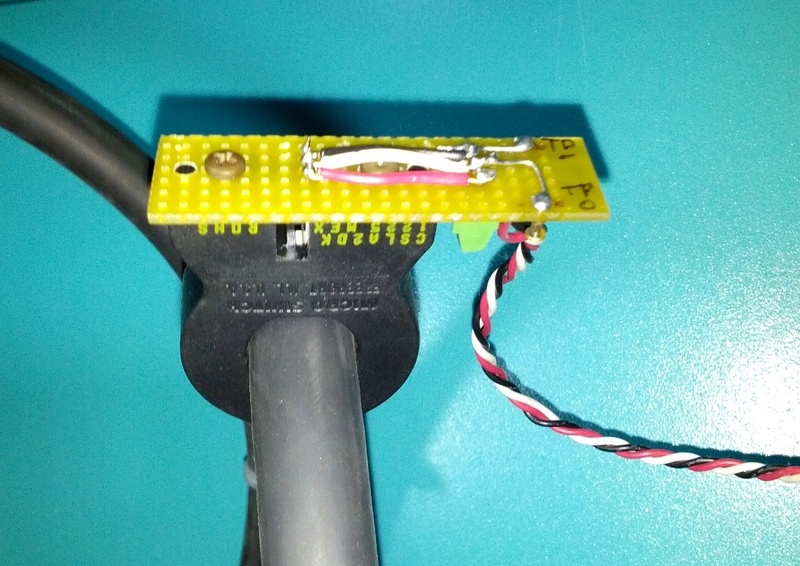 A non-contact current sensor was chosen to maintain complete isolation between the high-power mains-connected circuitry and the Arduino controller. The controller uses a telnet interface. 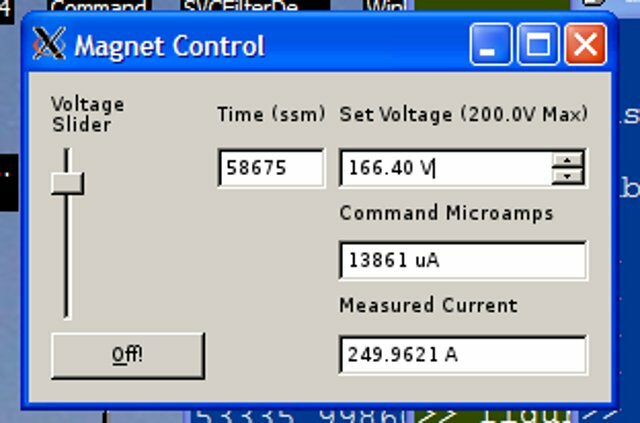 Simple text commands are used to set the supply voltage, to return a measurement of the current, and to shut down and reset the controller. The controller can be manually commanded from a terminal, but in normal operation, a graphical interface I wrote in Python establishes the telnet connection and allows easy control and display of the voltage and current. The GUI also logs the settings and measured current to a timestamped file for later data analysis. Even if a malicious actor gains access to the private network and takes control of the supply during operation, the worst case is really the brief disruption of scientific experiments.